Are you or someone you love affected by psoriasis? Most everyone knows someone with psoriasis. Thousands of people are affected. This skin condition creates red, scaly plaques on a person body. It is important to know psoriasis is NOT contagious and most people with psoriasis are self-conscious about their condition. It can affect what people wear and whether they go certain places, & can cause depression,affecting quality of life. Psoriasis is a disease of the immune system of the skin. The immune system mistakenly activates a certain white blood cell that triggers an inflammatory reaction and causes skin cells to form faster than they are supposed to. These cells pile up instead of shedding causing a scaly plaque. Psoriasis can be passed down genetically. If you are predisposed certain things can trigger a flare including stress, strept throat, winter weather, certain medications, or trauma to the skin. 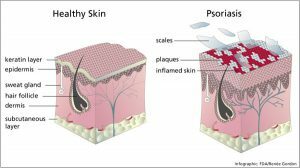 There are also different types of psoriasis affecting different parts of the body. Psoriasis can also affect your nails making them pitted or grow abnormally and the joints causing stiffness and arthritis. The good news is even though psoriasis can tend to be a chronic condition. There are a variety of ways to treat this condition including topicals, light therapy, injections, and systemic drugs. Lately, there have been even new advances in treatment options. At Gaughf Dermatology we offer laser light treatment (Xtrac Laser). We also prescribe systemic injections such as Enbrel© ,Humira©, Stelara©, Cosentyx©, as well as a new oral medication Otezla© which does not require blood monitoring. Because psoriasis can be embarrassing and affect quality life if you have psoriasis or know someone who does please refer them for treatment so we can help them have have clearer skin!